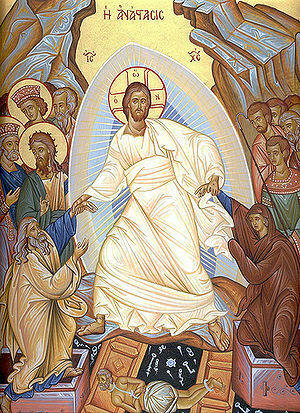 Why does the risen Lord still bear the marks of the wounds? And why do they comfort us? Here is a sermon that attempts to answer those questions. Wouldn’t a resurrection body by definition be better than new? If I were the one raising Jesus from the dead, I’d give him a body that was better than new. I’d fill in all the tissue that was chewed up by nail and thorn, and I’d knit the great gash in his side back together. I’d wash away all the dried blood and smooth away every mark of the whip. I’d cover all the wounds with skin like a newborn baby’s. Then I’d ease away all the soreness and stiffness. I would put all Jesus’ wounds into the past. I would give Jesus a body that was perfectly whole in every way. A body that can go through walls should by definition be perfectly whole. But the God who did raise Jesus from the dead had other ideas. When the risen Lord appeared among his followers on Easter evening, he greeted them with a reassuring word of peace. But then Jesus pushed back his clothes, and there all those wounds were, still deep, and still red. He insisted that his followers see and touch. Yep, that certainly did confirm that Jesus was the same one who had died on Friday. Yep, the wounds were in the right place. This wasn’t an imposter. But why couldn’t Jesus experience complete relief in the resurrection? To know it was him and to know he wasn’t a ghost, wouldn’t it have been enough for his followers just to see his face and touch whole, unwounded flesh? Wouldn’t it be enough just to see him eat the fish they offered? Why wasn’t the pain and the woundedness finished when Jesus drew his last breath on Friday? It would have been such a blessing to get the pain over with then. It’s a challenge to preach on Mark 16:1-8. Here is one of my attempts at it. On their way to the tomb, the women thought their big problem was the stone sealing the entrance. And it was very big and heavy–huge, Mark notes. The women wondered aloud who would roll it back for them. But this wasn’t all that big of a problem. If worst came to worst, and nobody was around, they could always go find somebody in town and come back. The stone was their problem, the women thought. Get that one solved, then they could finish giving Jesus a proper burial, and then they could head home to Galilee. They were filled with sorrow, of course. But they knew what to expect: grieving, but also going on with life as best they could. Get the stone problem solved, do one last act of caring for Jesus, then go home and figure out what next. It was a shock to find the tomb already wide open! What’s more, somebody was in there, and it wasn’t Jesus! He was gone. And here was a messenger dressed all in white. “Don’t be afraid,” the messenger said. Their hearts must have nearly stopped. “Don’t be afraid,” he said, the first thing that just about every messenger from God says. Notice: the messenger didn’t say, “There you might see him,” or “There you can see him,” or “There you should see him.” The messenger said, “There you will see him.” No question. They were definitely going to see him. The place for them to go was home, to Galilee. But Galilee was so much more: it was the place where they met Jesus the first time. In Mark chapter 1, Jesus starts his ministry by moving into Galilee after the arrest of John the Baptist. The gospel story is getting ready to start all over again in Galilee. Galilee was the place where the disciples and the women all first got called, where Jesus taught hard lessons, healed the sick, battled demons and so much more. What would Jesus do this time? If past history is any indication, Jesus was going to do much more than simply greet them, “Hi, friends! How are you? Good to see you again.” He was going to ask something of them. He might even start in again on that business about the call to take up the cross. No wonder the women were afraid! This isn’t cowardice or timidity here. This is holy fear in the presence of God, as when the prophet Ezekiel fell down in a heap when he saw the glory of God. As when the shepherds feared a great fear when angels appeared to them. As when the woman who had been healed from the flow of blood by touching Jesus’ robe came to him in fear and trembling and told him the whole story. As when the disciples were amazed when Jesus stilled the storm. This is appropriate, holy awe. They were stunned. Mary and Joseph both laid down their old lives in order to embrace new life in Jesus. The themes of Christmas and Easter hold together. Here is a review I wrote of a book entitled In Dying We Are Born, which calls the church to lay down its life in order to receive the gift of the resurrection. Yes, all Christians and all churches are called to die, and then we will be born anew by the power of God. In Dying We Are Born The Challenge and the Hope for Congregations By Peter Bush The Alban Institute, 2008. Pb. 138 pp. $17.00. “No, Lord! This shall never happen to you!” Peter cried when Jesus declared that the way to life led through death. Not said aloud but surely echoing in every disciple’s heart was this: “And it had better not happen to us, either!” Congregations and denominations in North America certainly don’t want it to happen to us. As we struggle with decline we want someone to tell us what to do so that we won’t die. That person is not Peter Bush. He calls the church to stop focusing on explanations, stop looking for people to blame, stop putting our faith in technical solutions, and above all, stop trying to save the church from dying. Instead, we need to start depending on the God of the resurrection to raise the church to new life in God’s own way and in God’s own time. The future of the church lies in dying and rising with Christ. Every church is called to die. There are no exceptions. Death means dying to self, taking up the cross, and following Jesus. We must be ready to lay everything down, even models of church and ways of doing ministry that we have cherished. For example, Bush believes that the assumption that there always should be paid full-time clergy in every local church is one that must die. Bush presents a succinct review of various models for congregational renewal. Generally they take one of two approaches: build on what you’ve got (e.g. Kennon Callahan and Christian Schwarz), or tear down and start again (e.g. Alice Mann and Easum & Bandy). Bush finds much that is helpful in these models, particularly where they recognize that God is the one who transforms lives and renews the church. He critiques them where they focus too much on human effort and human planning processes. Drawing on the whole range of scripture, Bush reintroduces us to the God of the resurrection, who alone breathes life into the church. He points to this God in action in the Book of Judges, as well as in Ezekiel 37 and in the Easter texts we expect to wrestle with in any discussion of resurrection. Bush also shows this God in action in stories of contemporary congregations that have been raised to new life. He offers much inspiring material for preaching and teaching. Leaders journeying with the church through death to resurrection must ourselves be willing to die and rise with Christ. We must die to our own plans and to our desire to be right. With a prayerful, humble spirit, we are called to refocus the church on God’s story, help the church to grieve what is lost, articulate the promise of the resurrection, and invite the church to trust God. Leaders guide the church to put God’s will for the church first, trust God’s ways, and stand in awe of the One who brings life out of death. Jesus told his disciples, “If any want to become my followers, let them deny themselves and take up their cross and follow me.” This means that every disciple, every congregation, every judicatory, every affinity group and every denomination must die. And then God will raise us to new life. Easter and Pentecost mark two movements in God’s great work of resurrection. Here is the story of St. Cyprian’s Episcopal Church, a small congregation in Oxford, North Carolina that is experiencing resurrection. The congregation’s junior warden describes the first phone call he received from their now-vicar as the “craziest Holy Spirit moment.” How apt! When God’s foolishness is greater than human wisdom, you’ve got to expect crazy Holy Spirit moments. This story comes from Faith and Leadership, a great web site from Duke Divinity School. In the sidebar you can click on another article about a model the Episcopal Church is using for leadership in small churches. Read St. Cyprian’s story and be inspired for Easter and Pentecost! 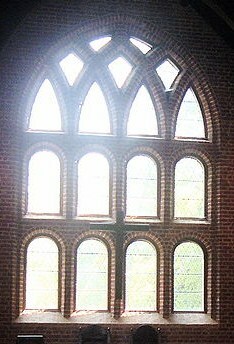 Once you start looking through the lens of Easter, everything looks tilted God-ward. Blessings to you all as we approach Easter again. 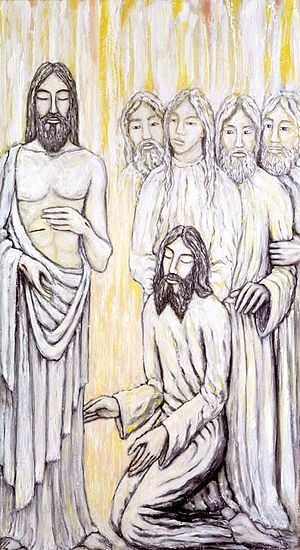 “Okay,” Pilate agreed with the chief priests and Pharisees. “Take a guard. Go and make the tomb as secure as you know how.” Something had stirred up their fears. They realized that Jesus might be even more dangerous to them dead than alive! Was this an afterthought, or did the Good Friday earthquake shake them up as it had the executioners? Something certainly had shaken them up. On Saturday the religious leaders hurried to see Pontius Pilate. Notice: it was the Sabbath, and it was unlawful to visit Pilate on the Sabbath, and unlawful at any time to go into his house. Their anxiety was so great that they were willing to break the very Sabbath law that they condemned Jesus for breaking. “Jesus may be dead,” they told Pilate, “but he said he would be raised to life three days later. His disciples might go steal his body, then spread a rumor that he has been raised. This lie would be even worse than the first one. That tomb’s got to stay shut,” they insisted. “You’ve got to make sure that nobody and no thing opens it!” In other words, they needed that tomb to be earthquake proof. 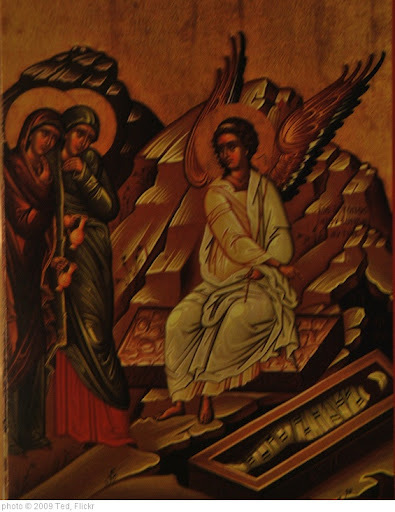 I recently learned that the apocryphal Gospel of Peter, one of the New Testament era books that didn’t make it into the Bible, pictures the sealing of the tomb. It says that the religious authorities all joined the guards in keeping watch over the tomb, and that they put not just one, but seven seals on it. Seven—the perfect number—and it was like multiple locks on a door: deadbolts, chains, sliding bars, like multiple barriers to keep somebody out, or else keep somebody else in. All eyes were on that tomb. As Sunday dawned there was nothing Mary Magdalene and the other Mary could do but look. They were helpless. Matthew highlights their helplessness because he says not a word about them bringing spices and ointments to anoint Jesus’ body. He says they just came to look. Look. Remember. Cry. Maybe start finding a way to move on. It had been beautiful while it lasted: the dream of the kingdom of heaven. Healing. Hope. Life as God intended. Why did Jesus have to die? Why did he have to be crushed? Seems like the world is always tilted in favor of the powerful. The ones with the money win. The ones with the weapons win. They always seem to get what they want. Dreamers like Jesus are a threat to people’s empires. The lowly don’t want to stay in their place when a dreamer like Jesus catches their imaginations. Dreamers threaten stability. Dreamers are troublemakers. They must die. This world seems inevitably slanted, skewed, shifted towards darkness, towards pain, sickness, death. Sometimes it seems that only the darkness is really real. Light is a temporary illusion. Death always wins. Nobody was going to open that grave that Sunday morning, and especially not these empty-handed women. But they could look and remember. Suddenly the ground started rocking and shifting beneath their feet. Another earthquake, a big one on the Richter scale! And at that moment, God’s shining angel descended, rolled back the stone, and sat on it like a conqueror. The guards trembled with terror, fainted dead away. The shocked women were also frightened, but they kept their wits about them, and heard the angel say what angels always say when they bring God’s message: “Don’t be afraid.” “Don’t be afraid,” he said. “I know you’re looking for Jesus who was crucified. He’s not here. He has been raised just as he said. Come see where he lay. Go quickly now, and tell his disciples, ‘He has been raised from death and now he is going to Galilee ahead of you. There you will see him.’” Afraid and joyful at the same time, they hurried off.